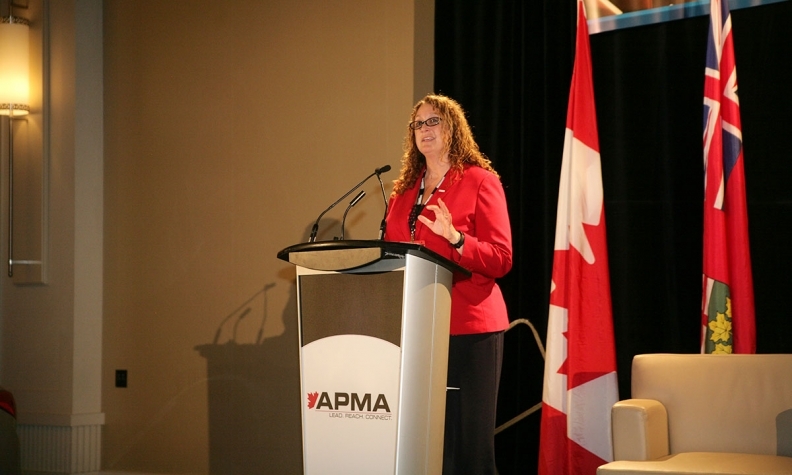 Kristen Tabar, vice president of the Toyota Technical Center's Technical Planning Office, details changes to Toyota and the auto industry at the Automotive Parts Manufacturer's Association conference in Windsor, Ontario. WINDSOR, Ont. -- If there’s a common thread among automakers, it’s the realization that growing the business means growing the customer base well beyond mere vehicle sales. And the sooner the better. Self-driving cars, an ascendant generation of young drivers, ride-sharing services and a shift to trucks and tall wagons from cars are all trends leading Toyota to re-examine its business models and offerings, a top Toyota official said at the annual Automotive Parts Manufacturer’s Association conference in Windsor on June 15. Kristen Tabar, vice-president of the Toyota Technical Center’s Technical Planning Office, said the most immediate change – rising truck and SUV sales and declining car sales – has been “good news” for Toyota’s Canadian facilities in Cambridge, Ont., and Woodstock, Ont., which produce the Toyota Corolla and RAV4 and the Lexus RX 350 and RX450 tall wagons. She said Toyota anticipates a slight increase in U.S. sales as an improved labour market and low fuel prices prop up demand for trucks and tall wagons. Toyota sales in Canada were up 7.1 per cent this year through May to 79,565 units, according to the Automotive News Data Center, thanks to a 19-per-cent jump in light-truck purchases. While also shifting to customer demand for trucks and tall wagons, changes in technology and in mobility are leading Toyota to re-examine its role as an automaker, Tabar said. “Automakers and suppliers today really need to shift and increase their roles beyond just designing, engineering and assembling fantastic-looking, fun-to-drive vehicles,” she said. Tabar said that Toyota, which has promised to implement automatic-braking systems as standard features on nearly all of its vehicles by 2017 (which is well ahead of the U.S. deadline of 2022), is keeping safety at the forefront as it develops autonomous technology. However, Tabar says it’s crucial for the automaker to address customers’ potential concerns with such technology in a “step-by-step” approach. “We need a vastly safer product,” Tabar said. As technology shifts, so too does customer behaviour, she said. Tabar said ride-sharing technology gives Toyota and other automakers a chance to both meet the demands of younger buyers while also increasing sales, running counter to a common assumption that sharing services could lead to a sales decline. “More ride-sharing could reduce the number of cars in each household, but this decrease could be offset by shorter [vehicle] life cycles,” she said. Toyota bought a small stake in ride-hire service Uber in May, a move that followed investments by General Motors and Volkswagen in the ride-hailing rivals Lyft and Gett, respectively. Tabar said it’s important for Toyota to invest in sharing services as millennials and those under the age of 17 — Generation Z — become larger parts of the marketplace. While most younger drivers say they plan to eventually own a car, Tabar said they are much more open to sharing services than their parents and grandparents, making it crucial to get ahead of the competition on sharing. “They have an on-demand consumption mentality,” she said.